Once upon a time, I worked as intern with the National Park Service. Fresh out of college, I blossomed into an avid hiker during my time as a post-secondary student. My internship seemed perfect at the time: I was to create a 5-year hiking trails management plan for Sunset Crater Volcano National Monument. For nearly six months, I worked directly with the park trails foreman, hashing out designs for brand new trails, or realignments for old ones. Our number one goal was to make the existing trails more sustainable, minimizing their impact on the natural environment. The new trails would do the same. We also made certain that all new designs would maximize user experience, and make Sunset Crater a more enjoyable place to visit. We completed the plan, but to be honest, it was a rough process. After I finished my work and left the park, I did not maintain contact with anyone that I had worked with there. At that time, I was doubtful that any part of the plan would ever be implemented. This all happened back in 2011. As of this writing, it is 2016. 5 years has elapsed since our 5-year management plan was completed. Last weekend, my wife I and took a quick trip into the park for an afternoon hike. As we drove through the volcanic landscape, I started to recall aloud to my wife some of the designs we had proposed in that plan. I still assumed that nothing had ever come of them. Views of O’Leary Peak and the Bonito Lava Flow at Sunset Crater Volcano National Monument. We pulled into the Lenox Crater Trailhead, which is just a pullout along the road. After gathering together some camera gear and a bit of water, we crossed the highway onto the trail. Something looked odd to me. My memory told me that Lenox Crater Trail climbed steeply straight up the hillside above us, but instead, it now swept diagonally up the hillside at a moderate grade. To the left, I piece of trail I did not recognize came in from the south. Then, a smile came across my face. I realized that our trail proposals had actually come to life! I looked at the map posted on a nearby sign. Sure enough, the Lenox Crater Trail, which was once a steep, erosion-prone out-and-back, was now a loop trail of a shallower grade. Additionally, the map showed three other maintained trails that previously only existed in the pages of the trails management plan. One was a connector from Lenox Crater to the Lava Flow Trail to south. 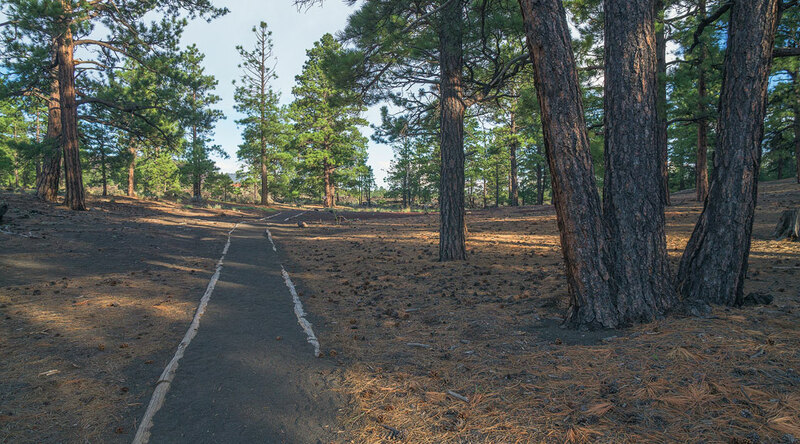 Another was a short spur to a viewshed overlooking Sunset Crater and the surrounding lava flows, named the Bonito Vista Trail. A third was an improvement of an existing social trail, given the name A’a Trail, after the Hawaiian name for rough, porous lava rock. It was surreal seeing the names I had picked out actually appearing right there on the map. The new trail junction where the Lenox Crater Trails meets the connector to the Lava Flow Trailhead. We made our way up the new Lenox Crater Trail, you know, just to test it out. This trail really turned out better than I imagined back when we were walking through cinders and planting flags in the ground. It hugs the terrain, following the curvature of the land, working with the hillside instead of against it. The grade is uphill but manageable, allowing users to enjoy the scenery rather than tearing all the breath from their lungs. The first leg of loop took us gradually up the north side of Lenox Crater’s cinder-clad slopes. Ponderosa pines lined the hillside, but an occasional view to the north could be spotted through the trees. As the trail approached the “lip” of the asymmetrical crater top, it turned sharply to the left and up toward the crown of Lenox. The grade steepened slightly, following a more aggressive path to the summit out of shear necessity. We designed this stretch of trail with timber logs as a trail liner, to minimize the effects of erosion on the steeper grade. The Lenox Crater Trail traverses the cinder-filled slopes. We saw the views open up to south, and climbed the last stretch of trail to the crater’s summit. A brand new viewing platform has been created there, replete with updated interpretive signs. The view here features the volcanic depression of the crater below, with the alpine summits of the San Francisco Peaks towering over the pine forests. The trail dropped us off the summit to the south, winding down the hillside in spectacular fashion. It was just a short stroll until the trail made another left hand turn to traverse down the eastern slope and back to the trailhead. As the summer sun made its way toward the western horizon, we had run out of time. Walking the rest of the park’s new trails would have to wait until another visit. From atop the summit of Lenox Crater, an expansive view of the surrounding volcanic landscape. Thinking back upon my time working at Sunset Crater, I’ve always had mixed feelings. I learned a lot, but also made a lot of mistakes. Ultimately, through my own immaturity I was unable to parlay my internship into another job working with hiking trails. For that, I have always looked upon my time there as time wasted, until now. Seeing my work come to life filled me with pride because I truly believe in our National Parks System. It is a real honor to have contributed to that system in a tangible way that better protects the landscape and allows people to enjoy Sunset Crater even more. It’s humbling to think that I helped create a permanent feature in a National Park that will serve the land and its visitors for years to come. The log-lined trail winds through the edge of the pine forests atop Lenox Crater. Sunset Crater Volcano National Monument is located just north of Flagstaff, Arizona, just off of Highway 89. It is a fairly small park, but features a visitor center along with numerous hiking trails and overlooks. An enthusiastic visitor can see all of the park’s attractions and walk all of it’s trails within a 2-4 hour period. Sunset Crater is often visited in conjunction with Wupatki National Monument to the north, and a visit to the two makes for a perfect half-day adventure. Entrance Fee: $20 covers entrance to Sunset Crater as well as Wupatki for 7 days. As an NPS unit, they absolutely accept your “America the Beautiful” annual parks pass as well the senior lifetime pass. Directions (to the Lenox Crater Trailhead): From the Flagstaff Mall, take Highway 89 north for about 11.5 miles. Turn right at signed turn for Sunset Crater Volcano National Monument. Continue on this road 2 miles to the entrance station. Pay the fee if the station is manned, but typically after 5pm the rangers go home and entrance is “free”. Continue another 1.5 miles to the Lenox Crater Trailhead, which is a pullout on the left-hand (north) side of the highway. I was at Sunset Crater not too long ago and saw the new trailhead by the Lava Flow Trail, but I didn’t hike it. I assumed it was just a connector and the Lenox Trail was still the same. I’ll have to check it out next time I go. Great post, Jake!